This bestseller is temporarily out-of-stock, so order now and we will ship ASAP! The WorryBug loves to make you worry. Why? Because worries are its favorite treat. And the more you worry...the more it will eat! It loves to push your worry button, hoping that one worry will lead to another. So to all of you worriers: Don't feed the WorryBug or your worries will grow! 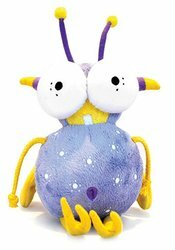 Book character plush makes perfect reading companion and wonderful addition to storytelling or free reading time. Want more? Click below for more WorryWoo Resources and Fun!